The online journal PaleoAnthropology has recently posted the longest boringest movie ever made! Why would anyone do that? Well, hopefully, you'll see for yourself. The movie begins with the earliest hominin fossil from between 7-6 million years ago and ....93 hours later... it ends with [SPOILER ALERT!] modern humans. You can download the movie here and you can also check out the brief article that accompanies it called, "Deep time in perspective: An animated fossil hominin timeline." Because here on the Mermaid's Tale I can address a broader audience--and I'm also free to write about celestial bodies and microbes as much as I please--I thought I'd post about the movie here. Darwin heavily stressed the concept of deep time in Origin of Species because he knew it was a major obstacle to understanding evolution. Deep, geologic time is absolutely crucial to evolution but it is difficult to grasp let alone represent in a drawing. Scientists, like everyone else, have no frame of reference and so the lapse of deep time is all but ignored in evolutionary trees, like this one that Darwin drew. A colleague of Darwin’s, a "Mr. Croll" mentioned in Origin of Species, offered a crafty illustration of dee p time. Demonstrations like this offer a glimpse into the expanse of deep time and conjure up a feeling of awe. Everyone should try Mr. Croll’s exercise. Wait. What? You don’t have 83 feet of paper? You’d like to experience more than one million years of deep time? Well, here’s a solution for you. It’s an animated movie of Mr. Croll’s strip of paper and the inspiration to make it came from marking off the hominin fossil record on a long strip of register receipt paper in Alan Walker's paleoanthropology lab several years ago. Because a movie about the entire fossil record of life on Earth might take a lifetime to make and a lifetime to watch, we focused in on the last six and a half million years of human evolution. We built a database of the majority of significant fossil hominin specimens beginning with the late Miocene Sahelanthropus cranium and going up until about 40,000 years ago. Then, with help from our programmer friends, we created a movie using the software Shockwave® that turned the record of hominin fossil specimens and their ages into an animated timeline. The movie pauses with each fossil to allow the viewer to see it. Skeleton icons represent complete and nearly complete skeletal remains. Skull icons represent complete and nearly complete skulls and crania. Partial skull icons represent skull fragments. Full tooth row icons represent nearly complete maxillae and mandibles. Partial tooth row icons stand for jaw fragments. A single molar icon stands for an isolated tooth. To watch the movie, you need to go to this link, find my article and click on "PA20110013_S03.zip." Download it, unzip it or "extract" the files (crucial), and then click on the "timeline" which should run in Mozilla Firefox or another browser. Detailed instructions on how to do this are here. When you open the movie, it starts rolling immediately. The movie can be stopped at any time by clicking on the red button, which, when clicked again, causes th e movie to resume playing. The default rate is 20 years per second and at this rate time ticks by at one generation (20 years) per second. When you watch the movie at the default rate for at least 2 minutes, you will experience onlyabout 2400 years and will see very few icons. At this rate, watching the entire 6.5 million yearsof the timeline would take about 93 hours! For a different perspective, you can click on the drop down menu and set the pace to 50,000 years per second (same as 2,500 generations per second). At this pace you can witness the entire timeline of hominin evolution in a more practical length of time... with the film taking only several minutes to watch from beginning to end. The clock starts at 6.5 Ma with the cranium from Chad (Sahelanthropus tchadensis). Time ticks by on the screen at the chosen rate until 6 Ma when symbols representing the next known specimens (belonging to the species called Orrorin tugenensis) flash into view. Then specimens belonging to Ardipithecus pop on the screen, and so on until the proliferation of anatomically modern humans in the Late Pleistocene. This movie offers a different perspective on the hominin fossil record from that of conventional evolutionary tree drawings, where the time span of a species is sometimes estimated based on a single specimen or very few specimens. See this diagram below for just one of the myriad examples (Dunsworth, 2007). There are literally tons of fossils in museums around the world, yet it is clear from watching the movie that there are more gaps than there are fossils. How can that be? Part of the answer has to do with the fact that not all creatures fossilize; and, of those that do fossilize, not all preserve to the present; and, of those that do preserve to the present, only a rare few are actually discovered by paleontologists. This enormous Earth is teeming with life. And it has been teeming with life for longer than we can comprehend from our limited perspective. So not only is the fossil record spotty because of the rare conditions that are required for fossils to form, and the special conditions that enable paleontologists to find them, but the fossil record also has gaps simply because it is so long. The record covers so much deep time that it is taking generations upon generations of scientists to fill in those gaps. Like your body, like the Milky Way, and like the universe, the fossil record is more empty space than matter. However, that does not diminish the wealth of information that we can glean from the thousands of hominin fossils and artifacts that have been discovered so far. 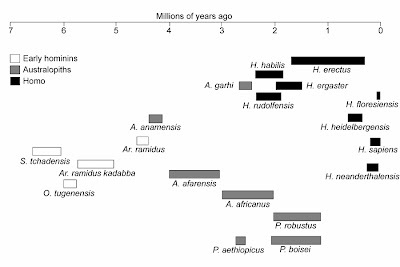 In general, hominin fossils are more similar to others that share space and/or time than they are to those found further away in space and/or time. There are a few instances where different types or species of hominins were living practically side-by-side (e.g. 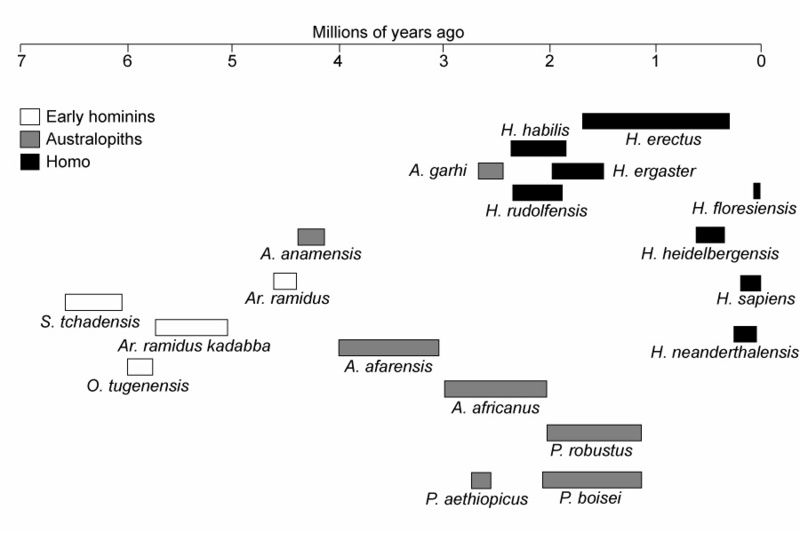 robust australopiths and early Homo) and when that is discovered, the hominins are placed on separate evolutionary lineages, marked by separate species or generic designations. Noting similarities and making distinctions are all part of the process that paleontologists use to reconstruct evolutionary history. In spite of the gaps in the hominin fossil record that are made obvious by the movie, scientists know a great deal about human evolution. The traits and behaviors that distinguish hominins at the genus level are evident in their teeth, their skulls, their bones and the artifacts that they leave behind such as stone tools and butchered bones. 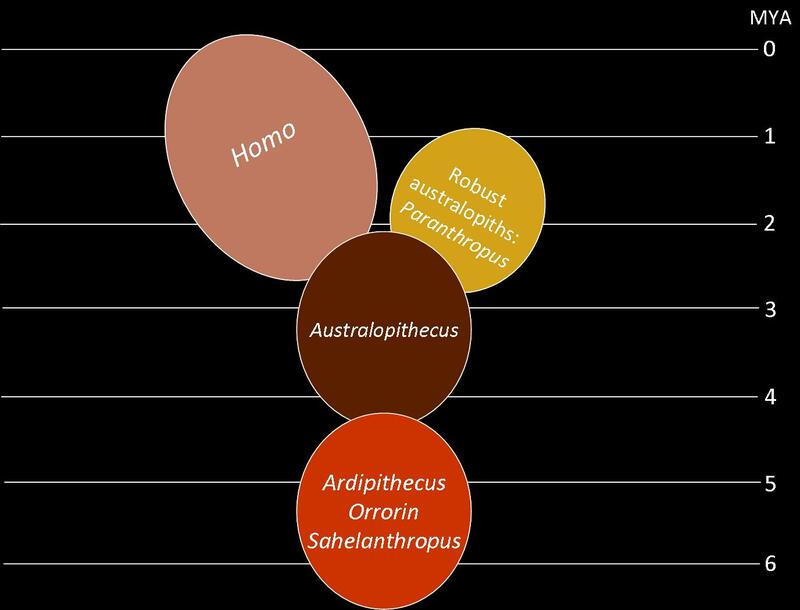 Ardipithecus, Orrorin, and Sahelanthropus: As the fossil record stands now, the bipedal abilities and adaptations of the earliest hominins are disputed (as is their inclusion as hominins!). Some of the teeth of these small-bodied apes have thick enamel and their canines are relatively small—both trends that link them to later hominins. Australopithecus: The main trend in the time of the australopiths is that of bipedal adaptation. It’s during this era that two separate lineages diverged: The robust australopiths (or Paranthropus) and the genus Homo to which humans belong. Robust australopiths (a.k.a. Paranthropus): With their large molars and large jaws, these hominins adapted to hard, tough diets and then went extinct. Homo: With their nearly modern (and, later, totally modern) skeleton, these hominins made and used stone tools as they added meat to their diet. It’s during this time that the brain makes a significant expansion. Species in the genus Homo are the only hominins to be discovered outside of Africa. 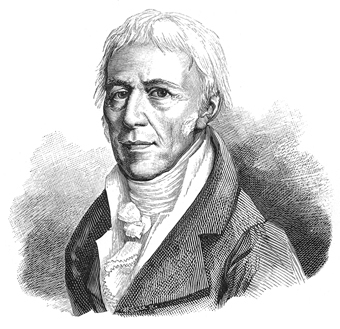 Prior to Darwin, Jean Baptiste Lamarck grappled with deep time and described how miniscule the present perspective is in comparison to the vast stretches of time that came before. Thanks to controlled breeding experiments on organisms like bacteria and basset hounds we can witness evolutionary changes. What’s more, that you are not a clone of your parents, that your generation is different from the previous one, is evolution. However, the dramatic changes that occurred over thousands and millions of years before the present, and that will carry on for thousands and millions of years into the future, are beyond our imagination. It is impossible to comprehend deep time. Even if we had a time machine and could visit an australopith 3 million years ago, we would only gain a snapshot of the past. To gain a better perspective on deep time than we have now—that is, to really se e evolution taking place—we would have to increase our life spans substantially, which would require a substantial increase in body size as well. Being as large as Earth would certainly give us a better feel for the lapse of deep, geologic time. Being as big as the Milky Way would be even better. And so on. This is why so many evolutionary biologists study microbes. To a microbe you are slow and absolutely enormous. It’s from this present and human point of view that we must continue to work towards the scientific truth about the evolution of all life on Earth, from microbes to mammals. Our inability to truly comprehend deep time does not prevent us from understanding evolution. As long as we accept our limitations we can forge ahead. Alan Walker was the inspiration behind this project which was carried out at Penn State University. Jessica Berry, Stephanie Kozakowski, Gail E. Krovitz, Maria Ochoa, Joseph D. Orkin, and Kelli L. Welker helped compile the fossil hominin database. Brian Shook and Patrick Besong creatively programmed our ideas into the computer. Kevin Stacey, Ken Weiss, and Michael Rogers provided helpful insights, comments, and discussion. Darwin, C. 1872. Origin of Species, 6th edition. John Murray, London. Dunsworth, HM. 2007. Human Origins 101. Greenwood Press, CT.
Dunsworth, HM. 2011. Deep time in perspective: An animated fossil hominin timeline. PaleoAnthropology 2011: 13-17. Lamarck, JB. 1809. Additions to Part I, Zoological Philosophy. From 1914 translation. Brilliant! I took an "Astronomy for Arts students" course (with my wife who was an Arts student) and the Professor was equally brilliant. He had us unwind rolls of toilet paper representing planetary distances from the sun until we out into the quad, into the downtown, and beyond, only to announce that on that scale (scaled to Earth as one roll), we still could not accommodate the gas giants, never mind (demoted) Pluto. That demonstrated aspect of vastness has never left me. Thanks John! That sounds fantastic. I agree that actually ticking off the marks on the paper and unrolling it makes a lasting impression, so people should definitely keep doing those exercises. Although this movie can't replace Mr. Croll's stip of paper for those reasons, it does lengthen it considerably. So it provides a much deeper and much more tedious (!) glimpse of deep time. And while it's doing that, it's showing how large and long the gaps are... which we're often reluctant to point out given how rapidly creationists pounce such pronouncements... but it's another important concept for the rest of us to grasp so that we can better reconstruct the past and perhaps be even more motivated to get boots on the ground and fill those gaps! I meant to write "rabidly" and it should say "pounce on"... there... now people can properly envision what I was envisioning :).